We are pleased to announce that ThorntonWeather.com’s lightning detector is now up and running! This new system will allow us (and you) to monitor in real-time approaching storms and to more accurately gauge how severe a storm is and where it is headed. Of course in the middle of winter there isn’t a lot to see on it but come spring, it will prove to be invaluable. For more information on the system and how it works, please click here. Colorado is ranked # 2 in lightning related deaths (1997 – 2006) so the danger this presents to life and property is very significant for us. It is interesting to note though that Colorado ranks only 31st in the number of cloud to ground strikes over that same period. This highlights the fact that, quite frankly, folks here in Colorado are ignorant about the dangers lightning presents and they simply do not take proper steps to protect themselves. For this reason, we have created a Lightning Education Center with more information about how you can protect yourself. Click here to visit it. – If you can see it or hear it, lightning can hit you. Find shelter now. – Lightning is the number two weather killer in the United States (behind floods). – Lightning kills about 60 people in the U.S. each year and inflicts severe life-long debilitating injuries on at least a 1,000 people a year. – Every 5 seconds between flash and boom is a mile’s distance from you. 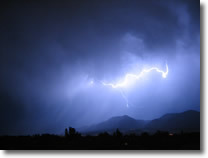 – Under ideal conditions, lightning’s thunder can be heard 12 miles away. – Lightning is really no wider than a few inches. – “Bolts from the Blue” – These lightning flashes have been documented to travel more than 25 miles away from the thunderstorm cloud. Clear skies above you are no indication of how dangerous a nearby storm is! This entry was posted on Sunday, December 23rd, 2007 at 4:09am MDT and is filed under Severe Weather, Site News. You can follow any responses to this entry through the RSS 2.0 feed. You can skip to the end and leave a response. Pinging is currently not allowed.